The 78 metre steam-powered superyacht SS Delphine, listed for sale by Joost Goverts at Northrop & Johnson in Palma, has now had a €16 million price drop. Built in steel and aluminium by US yard Great Lakes Engineering Works and delivered in 1921, SS Delphine is the largest steam ship ever built in the United States. She was ordered by Horace Dodge and named after his only daughter Delphine. She had an impressive restoration completed between 1997 and 2003 with no expense spared. Accommodation is for 26 guests in two VIP suites, nine double cabins and a four-bunk cabin. Power comes from two 1,500hp quadruple steam expansion engines giving her a range of 3,000 nautical miles at her cruising speed of 9 knots. Like so many classic yachts, she has endured many trials, including being requisitioned by the US Navy in World War II after which she fell into disrepair for many years. She was sold in 1997 at a scrap metal price to her current owners, who proceeded to restore her for $60 million to the original 1921 condition including interior decor and the original steam engines. 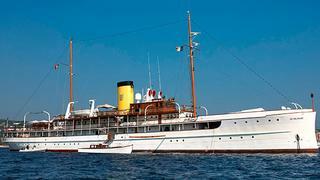 She was rechristened SS Delphine by Princess Stéphanie of Monaco on 10 September 2003. SS Delphine originally came on to the market in July 2013 asking €38 million but has since had several price changes and currency switches from euros to dollars and back again.